Scarce Map of Cispata Bay, Cordoba, Colombia. Plan de la Baye de Zisapata a la Coste de Terre ferme. 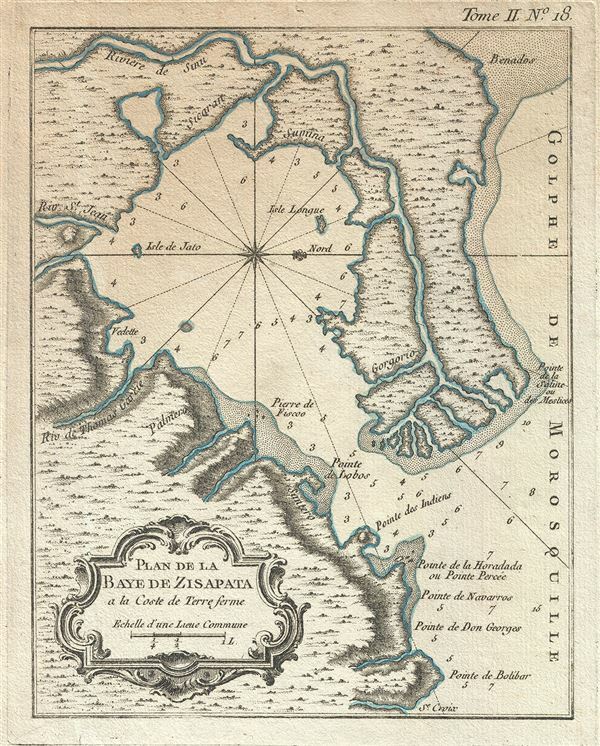 This is an attractive 1764 Map of the Cispata Bay, Columbia by Jacques Nicolas Bellin. Oriented with north in the east, the map covers the Cispata Bay located near San Antero in Cordoba on the Colombian Caribbean Coast. Part of the Morrosquillo Gulf, Cispata beaches are popular tourist destinations, famous for their crystal clear beaches and white sands. The map notes several rivers, points and other topographical features. Some oceanic depths are indicated and coastal features noted. This map was issued by Jacques Nicolas Bellin in his 1764 edition of Le Petit Atlas Maritime Recueil De Cartes et Plans Des Quatre Parties Du Monde. Bellin, J. N., Le Petit Atlas Maritime (Paris) 1764. Bellin's Petit Atlas Maritime was a five volume atlas of all parts of the world published in Paris in 1764. The atlas is a combination of fresh material and previous issued Bellin maps. The breakdown of volumes is as follows: Volume I: North America and the Caribbean (102 Maps), Volume II: South America (89 maps), Volume III: Asia and Africa (127 maps), Volume IV: Europe (130 maps), and Volume V: France (132 maps), for a total of 580 maps and plans. This important atlas marked a major transition in European nautical mapping. It's significance is most accentuated by comparison to Bellin's other great atlas, L’Hydrographie Française, a large format work much akin to Dutch nautical atlases of the previous century. The Petit Atlas Maritime, on the other hand, was issued in a more compact format that allow for a diverse wealth of individual maps. Stylistically, it had more in common with European road atlases than with other nautical atlases of the period. As the largest collection of plans of harbors and nautical maps available at the time of publication, the Petite Atlas Maritime work proved popular with navigators and armchair adventurers alike. Its universal appeal gave rise to new convention in maritime mapping. The atlas was sponsored by the Duc de Choiseul. J. Arrivet is listed as engraver on the chart index pages, but there is a great likelihood he also engraved the maps and plans. Very good. Original platemark visible. Minor Foxing.